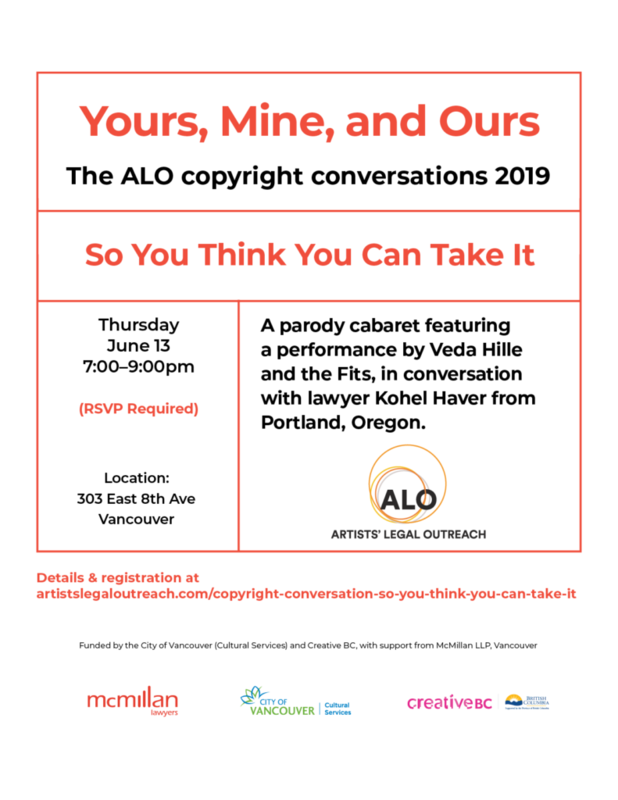 Artists’ Legal Outreach presents the next event in the Yours, Mine, and Ours: The ALO Copyright Conversations 2019 on June 14, 2019. Plan to join the conversation! Join us for a parody cabaret featuring a performance by Veda Hille and the Fits, and a conversation with lawyer Kohel Haver from Portland, Oregon. RSVPs are required. Check back for the registration link shortly. Get more details about the Yours, Mine, and Ours series here. ALO acknowledges that these events are held on the traditional and unceded territories of the Coast Salish peoples of the xʷməθkwəy̓əm (Musqueam), Skwxwú7mesh (Squamish), and Səl̓ílwətaɬ (Tsleil-Waututh) Nations. Financial assistance for the Yours, Mine, and Ours series is provided by the City of Vancouver Cultural Services and CreativeBC. Additional support provided by McMillan LLP, Vancouver.